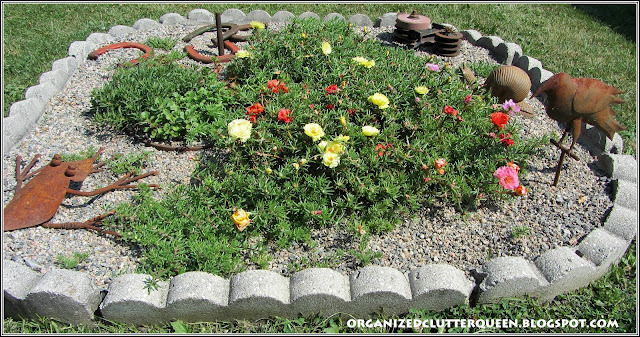 About five years ago, I made this little flower bed into a little succulent garden as it gets full sun all day long. 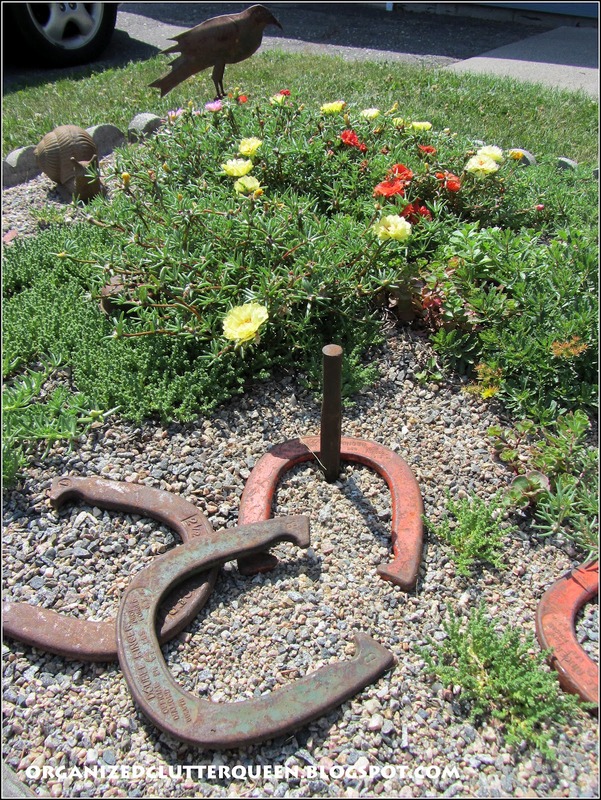 The center is three old metal wheels with sedums and moss roses planted in between the wheel spokes. Pea gravel surrounds the wheels. 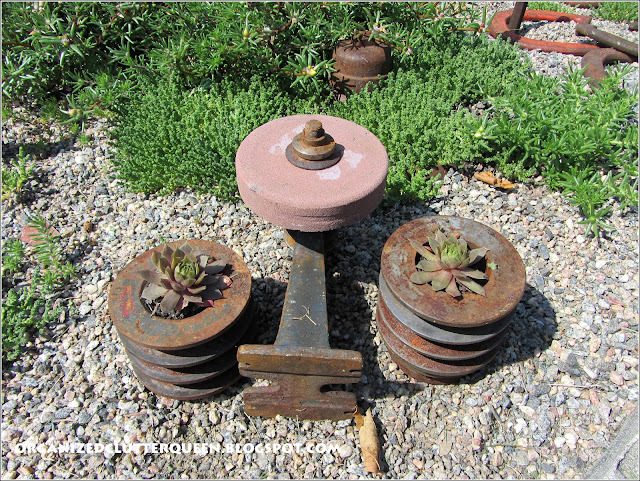 As the years have gone by, I have let moss rose seeds pop up wherever, and the sedums roam outside the wheels too. Besides the three rusty wheels and succulents, of course there is fun, rusty, garden art (junk) too. The succulent bed is edged with a manufactured cement scallop. None of the sedum are currently in bloom but a few moss roses are open. 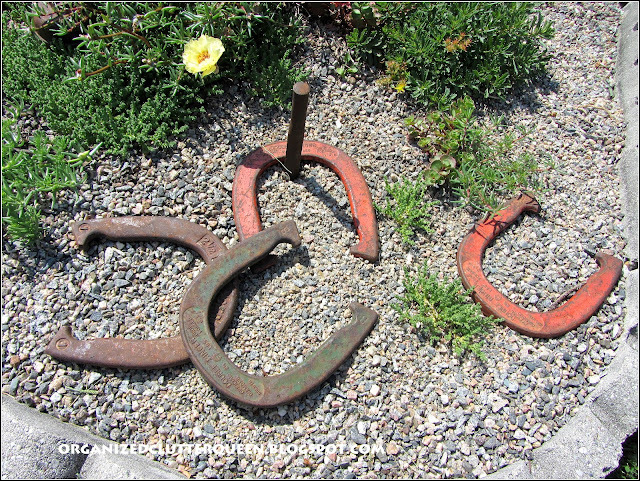 The vintage Double Ringer metal horseshoes are a new garage find this year for $2. There were no stakes, but I improvised with a $2 consignment store purchase of a rusty stake (maybe a tool of some kind). These were the pulleys and parts from my Grandpa's old knife sharpening set up. I just blogged about the pulleys in my recent post "Free Junk". This is a metal, but not vintage, snail that I picked up at a surplus shop for $11 a couple years ago. Believe it or not, the bird was originally a dollar store, metal, cheaply painted bird/yard ornament that weathered and rusted nicely from the elements. I saw it at my Mom's house and wanted to take it home. An interesting little succulent/junk bed. Not gorgeous, just interesting. Have I inspired you yet to decorate your gardens with junk? I just love your style! What a great garden! I love that crow for sure! YOur moss roses look great...mine look like something's been eating them. What a great unique garden! I love all the this-and-that in between the succulents! Thanks so much for joining TUTORIALS TIPS AND TIDBITS and showing us your one-of-a-kind garden! Your succulent garden is really neat. I love the added "junk". It does make the garden so interesting. I love your garden junk! You saw my rusty ole bike, so I guess your "junk" gardens are rubbing off on me! 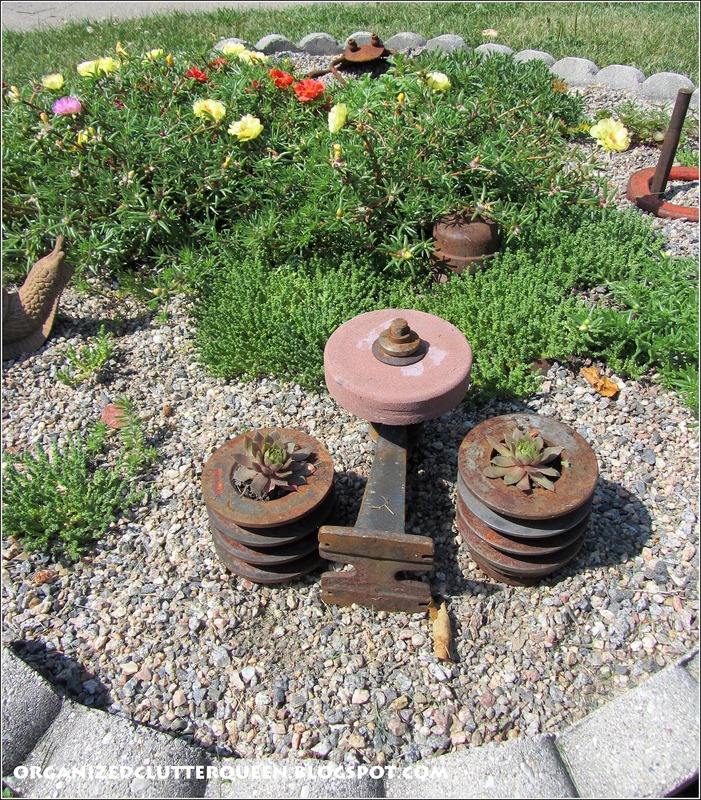 I love the way you decorate your gardens with the old junk. I get many ideas from you! That's my kind of decorating. 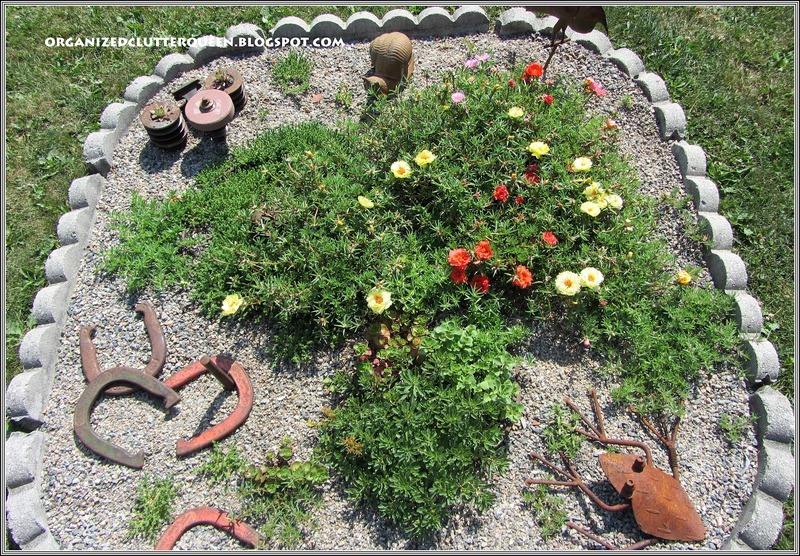 . .
What an adorable junk garden! We love succulents....we can't kill them, so they do nicely ~ lol!! 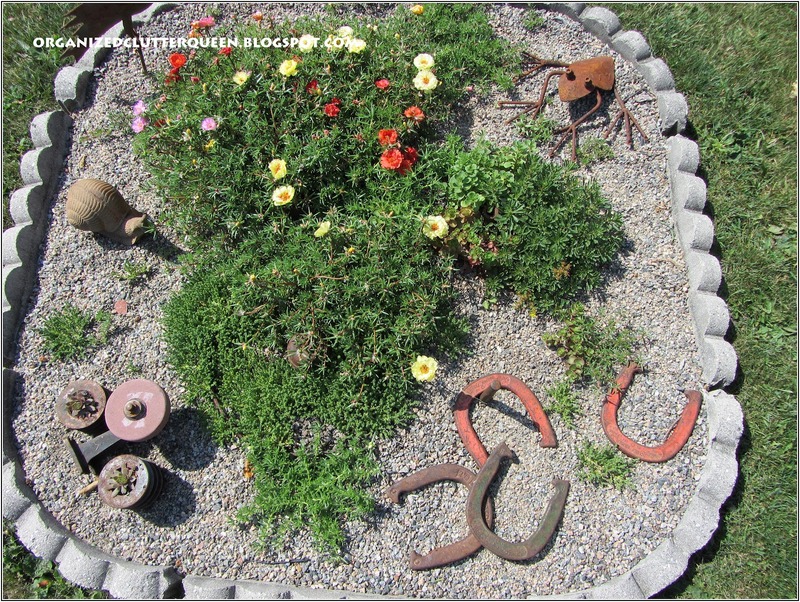 You just gave me some inspiration for a place in our yard that just needs something...I can see it now...Thanks for sharing..
What a charming garden bed. 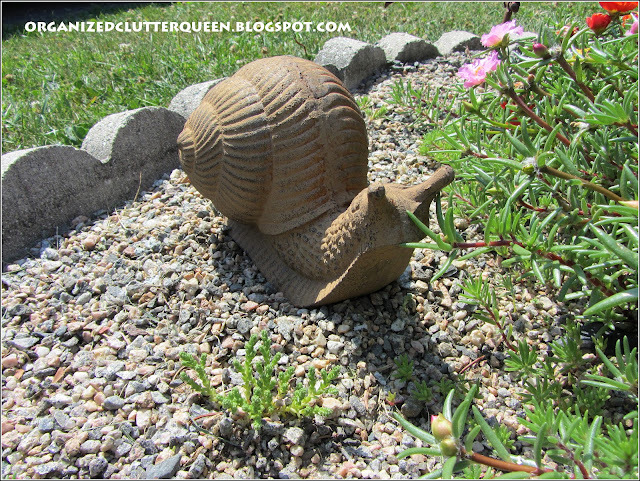 I love old stuff in the garden, so I love what you've added as accents to your plants! 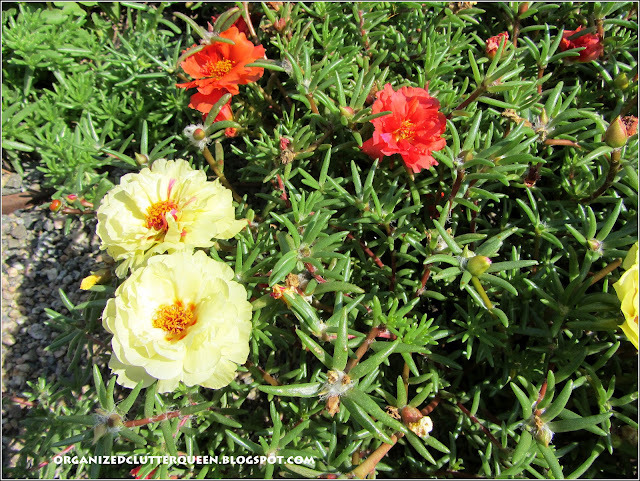 I have ever seen moss roses--beautiful! I love the horseshoe find! 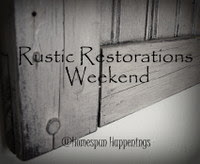 they are perfect in the garden:) Thank you so much for linking this up to Rustic Restorations Weekend! You always make junk look beautiful! I am a big fan of that bird. Who'd have thought it was a dollar store bird! Also like the horseshoes. So much fun to see what's going on at your place. 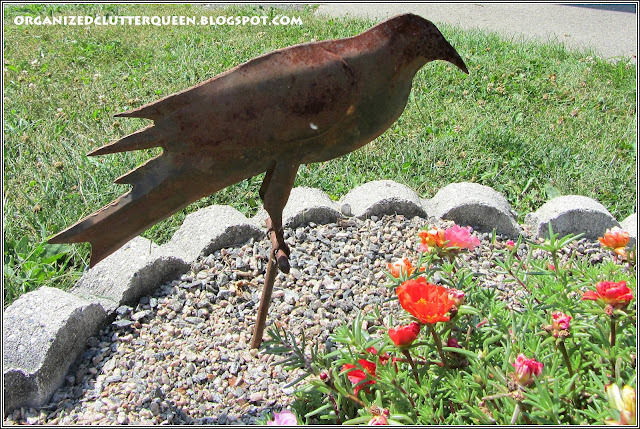 I love all the perfect little rusty treasures you have in this flower bed. I really love the horseshoes. Thank you for sharing at TTF this week. I hope you have a great weekend! 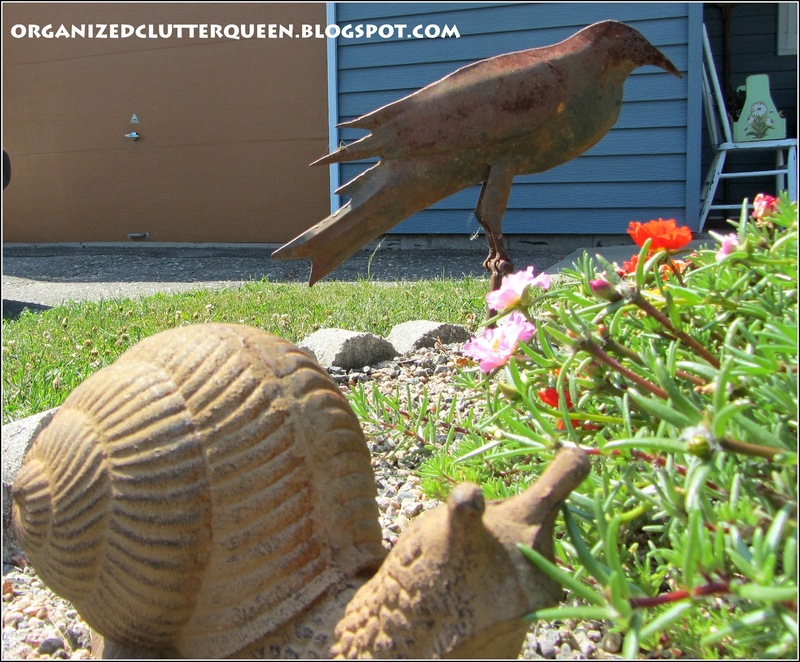 I love to decorate with junk ....inside and out :0) Your garden is great !